Designed by architect Paul Rudolph as a progressive mental health center and opened in 1971, the chapel in the Erich Lindemann Mental Health Center was added late in the planning process. 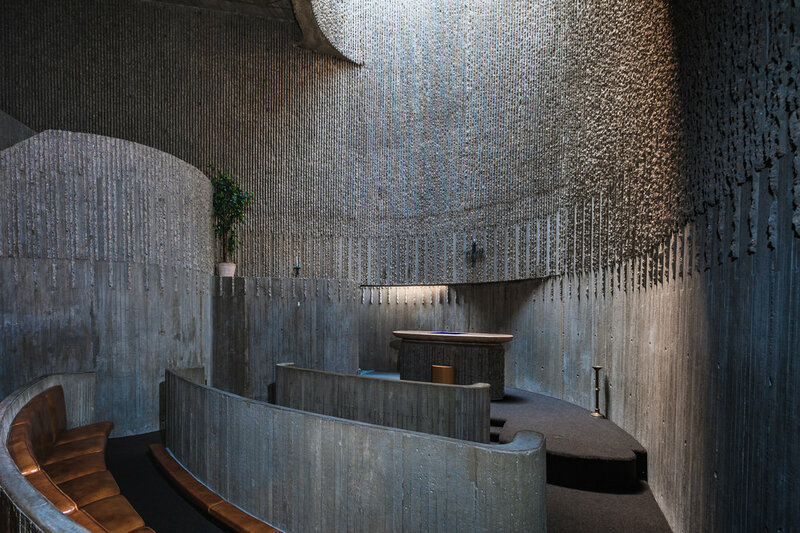 The chapel space, which includes a balcony and seating area that are not internally connected, is sculpted from curved wall surfaces made of Rudolph's signature cast concrete, yet there is a veil-like delicacy to the wall surface that makes it unlike the rest of the building. The chapel was intended as a private, meditative space in the center of a monumental modern building, set on a busy public square in a rapidly growing city. See also historian Tim Rohan's article in the Boston Globe (September 7, 2014). And take a tour of other spaces in downtown Boston.